Every time you see a hoarding or read an advertisement that says makeup course and classes, you might be left wondering about the benefits of enrolling in a similar course. Apart from turning yourself into an entrepreneur, you can learn the tricks of applying makeup on your own, and even learn to apply makeup on a bride. 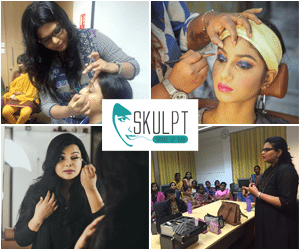 If you are looking for self-makeup courses in Chennai, look no further than Skulpt Makeup Bar. In recent times, women have climbed the corporate ladder and feeling good about oneself is no longer a choice or an option. When you get dressed for the day and complete your makeup by applying your eyeliner and highlight your cheek bones with the colour of your choice, you know you have plenty of reasons to fall in love with yourself. Take a look at the flip side. In addition to juggling professional and personal life, women have less time to spend on themselves and often compromise on looking good. The best way to pamper a woman would be to gift her a short course or workshop on makeup. These classes are conducted in groups, or you can opt for the private classes for you. The pricing too is reasonable, and a small portion of the money is used to purchase the makeup kit and products. You can take home a kit and for your personal use, which is another reason for the cost-effective fees. Most of the makeup classes are conducted for a few hours or can span for an entire day. You can sign up for a day’s class with your gal pals to make it interesting, or you can attend the few hours session at your convenience. Remember to join a trusted and reputed Academy or workshop. Do not get lured by attractive offers and discounts. If you know your burgundy shade from the glossy red lipstick, or you know which colour eye shadow goes well with the evening gown, you are few steps away from turning into an expert. Hone your skills- Try applying makeup on your sister or mother, so you get a good practice. Your sister’s skin tone is different from your niece, so you know which product and colour to use on them. Join a makeup school- No matter how confident you appear, it is a good choice to enrol yourself in a makeup course. Industry experts will provide an insight into the latest techniques that are currently in use. A career as a bridal makeup artist requires skill and training in latest wedding makeup techniques.Professional wedding makeup artist in chennai will provide an insight into the latest techniques in use. Don’t you love to get inked? A name of your loved one or a symbol that holds a special place in your heart often makes its way in the form of a tattoo on your body. Several classes provide you greater insight into this procedure. If you are looking for a job as a tattoo artist, you can enrol for these workshops in centres near you. Gradually over time, you can turn into a makeup artist.